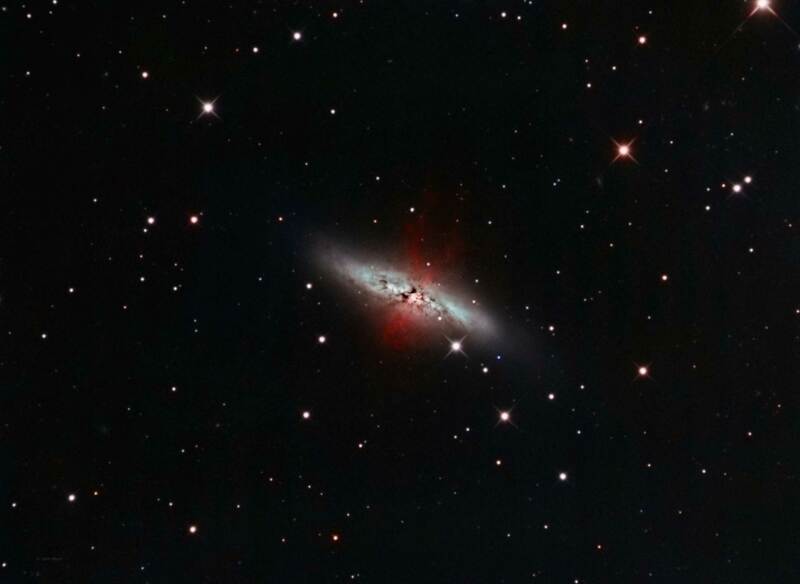 Messier 82 is an irregular galaxy in the constellation Ursa Major however it is also classified as a starburst galaxy. A starburst galaxy is a galaxy that has had a gravitational interaction with another galaxy and this interaction has spurred star formation at a rapid rate. In this case it interacted with Messier 81 several hundred million years ago but now the two galaxies are about 150,000 light years apart. The area above and below the core show these starburst areas and they appear as if they are exploding out and away from the galaxy core. These red filaments extend about 20,000 light years above and below the galaxy core. Their reddish color along with several dust lanes stand out from the rest of the bright galaxy. I tried to bring this out in my image by adding Hydrogen Alpha data to the red channel. The Hubble Space Telescope has discovered close to 200 young globular clusters in this galaxy and this was probably the result of the interaction with M81 several hundred million years ago. These globular clusters are very young at 600 million years compared to the globular clusters in our galaxy which average 12 billion years. It is estimated that star formation in M82 has increased tenfold since its interaction with M81. Most of the star formation is occurring near the core of the galaxy in four clumps that are visible in visual wavelengths and they correspond with sources taken in X-ray, infrared, and radio wavelengths. This image was captured from my home in a Bortle 6 zone using LRGB filters with some added Ha data using a 3nm Ha filter. The Ha data was blended with the red channel. The conditions were relatively good as humidity was lower than usual and the wind was calm.